Hello lovely readers! I apologise for my absence this month but I've just started a new job and I've been rather occupied lately, which has led to a spot of 'writers block'. I want to start a new blog timetable (one that is achievable and will hopefully last more than a couple of weeks). So for today's blog post I thought I'd write about my favourite products from the drugstore. 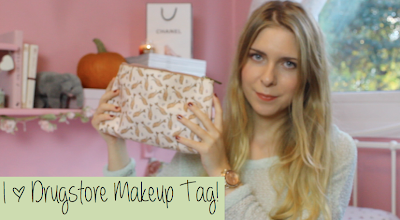 I was recently tagged in the "I ♥ Drugstore Makeup TAG!" on YouTube so I'll leave the video to that below. I'd have to say Rimmel because that's the brand that I have most of. Their product range is fantastic and they have really great colour/shade choices. I think their products are excellent for the affordable price tag. Face: Rimmel Match Perfection Foundation because it's a really light-weight consistency which is great for days where you don't want to wear anything to thick on your face, yet it has excellent coverage and lasts all day. Cheek: Sleek Blushers because they are sooo pigmented and have a really nice colour range. They stay and are amazing value for only £4.49, they also have some Nars dupes too! Lip: The Revlon ColourBurst Lip Butters are amazingly hydrating and moisturising and leave the lips soft and smooth. A little pricey at £7.99 but great at what they do. Rimmel Professional Eyebrow Pencil only because it's way too light for my eyebrows and doesn't match at all. Great little piece of kit for only £2.99 but unfortunately unsuitable for my brows. Without a doubt the Collection Lasting Perfection Concealer! If you haven't heard of this then where have you been?! 5. What is your favorite underdog product? So this is a product that doesn't get the attention it deserves, and I would definitely say the Soap and Glory Thick & Fast Mascara and Supercat Eyeliner Pen (full review here). These products are amazing and I hardly hear anyone talk about them! This was really hard to choose because the majority of drugstore products are low-cost. But I'd have to say the Bourjois ColourBoost Lip Crayons. The only thing stopping me from buying all the colours is the £7.99 price tag. Although I will say that they are very good at what they do. Oh this was easy - the MUA Undressed palette is a perfect dupe for the Urban Decay Naked Palette! and almost £20 cheaper! I bought this eyeshadow palette purely because I didn't want to take my beloved Naked palette backpacking with me and this £4 dupe was perfect because the shades are almost exact.